April 10, 2018 - ﻿All deskpads shipped out. GB complete. April 6, 2018 - ﻿Received all the deskpads. Sorting and packaging will happen during the weekend and most orders will be shipped out Monday. March 31, 2018 - ﻿I am still waiting on UPS for delivery. It seems like the package is taking a little bit longer (probably because it weighs over 1,000 pounds). It looks like it set to be delivered this coming week. March 19, 2018 - ﻿Stitching for Laser pads were not acceptable and have been changed back to just a black stitching. Godspeed pads were fine. Order has been shipped to me, and I should be able to get these near the end of next week. 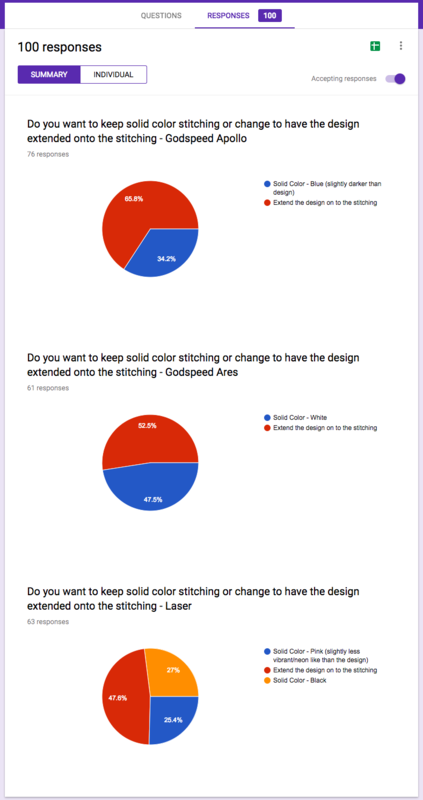 February 28, 2018 - Results of the vote are in - majority voted to extend the design onto the stitching. - https://i.imgur.com/0jYdMl4.png. That information has been passed to the manufacturer. February 27, 2018 - Need to vote on stitching design. Check that out here. Vote is only open until 8:00pm on the 28th. February 22, 2018 - Order has been placed for the deskpads. Late March still seems to be on track as long as there are no delays in manufacturing and shipping. February 16, 2018 - GB has closed. We have hit MOQ for all the different colored stitching.